The road map of Hamilton City in Bermuda looks like a matrix. There are streets from East to West that are crisscrossed by roads going South to North. The main streets that run east to west includes Front Street (which is nearest to the Hamilton Harbor), followed by Reid Street which is just north of Front Street and runs parallel to it. Then there is Church street which is north of Reid Street and again runs parallel to the other two. Other major east-west streets further north includes Victoria Street and Dundonald street. The two main streets that run North-South are the Queen Street and King Street on two sides of Front Street. Burn Bay Street, Parliament Street and Court streets are the other main North-South streets in Hamilton. 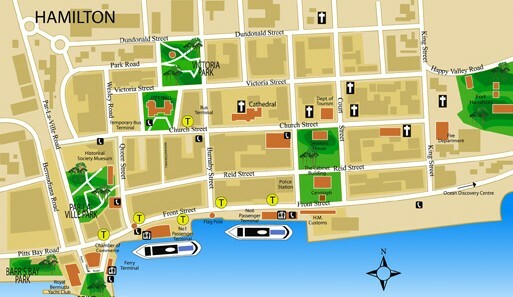 In the map below, you can see the two cruise ships berths along Front Street where the cruise ships in Hamilton dock. Here is an interactive map showing the roads and major landmarks of Hamilton City. You can zoom in or out by clicking + or - buttons on the map. 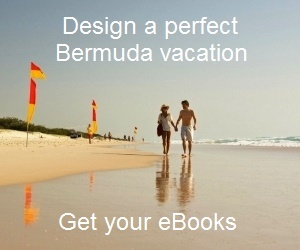 Alternatively you can double click at any point to zoom in. As you zoom, you can see many landmarks and places of attractions within Hamilton City. The city area is shown shaded with a border.